Opened in November 2015, GreenFare Organic Cafe is a full service restaurant that focuses on healthy food prepared without any animal products, and free of added salt, oil, and sugar with all organic ingredients. We are an innovative community cafe and learning center that serves organic, whole plant food in concert with medical professionals, environmentalists, and animal welfare advocates who recognize that this optimal diet can positively transform our world. We are 1 of 6 USDA certified organic restaurants in the U.S.
GreenFare was recently awarded the eatREAL.org Platinum certification for excellence in Epicurean, Agriculture, Leadership, and Sustainability categories. We are the only restaurant in Virginia and 1 of 5 in the U.S. to be certified at this highest level. Went for lunch. The food was good but I thought it was expensive. $16 for an entree. One menu. I’ve been to many vegan restaurants before and I knew that GreenFare will be a different experience due to not adding salt or oil in cooking and no processed foods. However, that doesn’t excuse the lack of seasoning and texture in the food. I ordered the risotto and felt like I was eating bland mush. The potatoe and kale and Alfredo was better but still lacked flavor. The ginger bowl was ok. The best thing we had was the sweet potato lasagna. 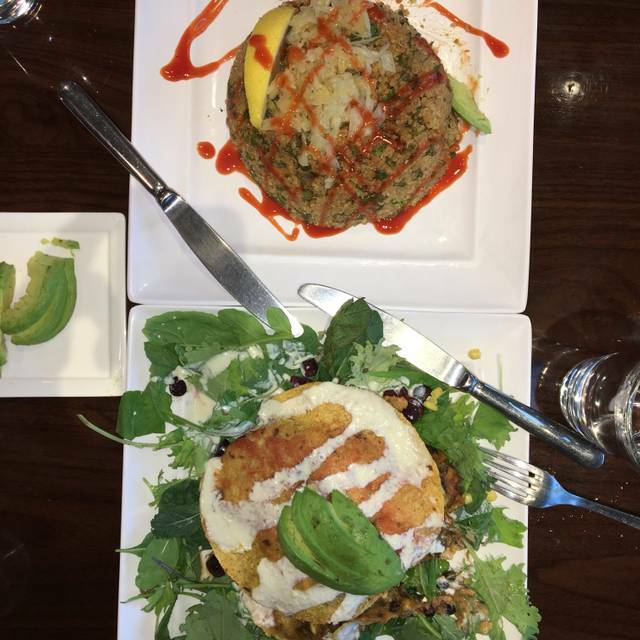 The mission of the restaurant is great and the service was good but being an organic vegan spot doesn’t mean lack of flavor and textures. The menu needs some help but the restaurant has a lot of potential. GreenFare is an excellent choice for Vegans/Vegetarians, actually there are not many restaurants in this area that are Vegan only. Portion sizes are large (enough for two people) and there are Gluten Free options. The atmosphere is casual and the service was excellent and friendly. Outstanding meals. Forget the fact that it is vegan, just enjoy! I've tried many dishes and haven't had one yet that I haven't liked...or loved! Always a GREAT place. Gwynn and her team do plant based right!!!! They host many events as well. Give them a try... you will go back. The food is excellent with great service. Love this restaurant! Amazing combination of healthy (no added oils, salt or sugar) AND delicious plant based food. Things are labeled for allergies which is helpful as well. Great desserts too! Informal atmosphere that can be both casual or nice for a special occasion or date night (I’ve done all of the above there). Friendly and knowledgeable service also! Healthy food can taste good when it is prepared well and when done creatively. This restaurant focuses on being "only one of 6 certified organic in the country", not on taste. Add to it that the place was downright cold - I had to eat my lunch without taking the winter coat off. The waitress was wearing her down puffer as well. All in all, not a great experience. They told me that you should eat this stuff for 3 weeks to completely re-train your taste buds and start craving it. To me, it is not about not eating animal proteins, it is about the taste - having salt, pepper and hot sauce on the table so customers can make their food more palatable themselves is not really a solution - more of a deonstration of a problem. Any good restaurant would not have that on the table, so you can experience the food the way chef designed it. Here it is: put more salt on it, maybe it will seem better. This was our first visit to GreenFare, the food was delicious, the staff was friendly. I drive over an hour to try the food and it was well worth the visit. There aren’t enough restaurants that serve true whole food plant based options. My only complaint would be the additional add on’s to the meal for $3 each dish, I thought there would have been more mushrooms in my dish and tofu for my husbands. Quaint, clean dining area, featuring a delicious assortment of appetizers that is no processed sugars, no added salt and no oil. Personable and prompt service, too. We'll be returning for lunch soon! If you are a Nutritarian (like we are) or anyone who wants to live a healthier lifestyle, this restaurant will show you that you don't have to limit the taste of food in your life. There is no better restaurant for healthy eating in the Washington DC area. Other vegan restaurants do not hesitate to add salt, sugar or oil to the food. The food here is outstanding. Nice desserts! Overall a bit pricey and slow service, but very tasty. No other choices like it around! I loved the warm and peaceful atmosphere within the cafe. I enjoyed the lasagna and it was so rich in flavor. I am no experimenting with vegan recipes at home! I adored this place. My son and I were in Herndon for a Science Olympiad. The owner was there, engaged, and passionate about what they do, and they do it extremely well. We are not vegan, but we had the vegan lasagna and fettucini options and were delighted. The desserts were phenomenal. W e shall return. My favorite and only one Vegan Restaurant. I can't image another place like this. It is probably the only one. No salt added not fat and wholefood, Oh My God It's what I do every day at home; then being at Greenfare Cafe is like being at home. A very nice restaurant with a quiet atmosphere. I would definitely visit this restaurant again. The food selection was great also. Nice atmosphere. The menu is derived from local, seasonal vegan food made out of whole unprocessed plant foods. No added oil. No added sugar. Fresh and refreshing. When I go to vegan places as a non-vegan I get tired of faux dishes that don’t come close. GreenFare doesn’t provide pretend anything, it provides vegan dishes that are made to order and, from my experience, delightful. We had the Thai quinoa & the black bean, sweet potato enchilada, both were excellent. This is a weekly mainstay for us. They are the epitome of a vegan restaurant. Their dishes are cooked to order, so the wait may be slightly longer, but well worth it. If you want true, delicious vegan, this is your place. Waiter had a lots of attitude, service was bad, food mediocre. My brother and I took our dad out for a Father’s Day dinner. It was our first time dining at this restaurant and we underestimated the portion size of our dishes. We ordered the Thai Quinoa, Spinach Alfredo with Tofu, and the Salad. We highly recommend the chocolate nut pie! Delicious and healthy food. Good service. Doesn’t get any better. Love this place! Service was just a little slow, dinner with a group of 7 took close to two hours. Fantastic food and lovely, friendly service. Everything on the menu is organic and plant-based (vegan). All items are delicious! Great atmosphere and very fresh and creative food! My daughter is vegan so we're always looking for options to support her. We are carnivores (did I really just admit that?) but really appreciate thoughtfully prepared plant-based food. This place CARES about quality and how a plant-based diet is so important to a healthy (symptom-free) lifestyle. The Southwest Chipotle Bowl is so filling, more than one person can eat and delicious! Considering your KickStart Program. I bought a cookbook! We saw this restaurant on a tv special and decided to check it out. My husband worked in our Pastor's house but didn't want him to pay so he suggested eating out somewhere and I jumped at the chance to come to Green Fare. I nor any of us are vegan. My husband and I are close to vegetarian's so this type of food was familiar. Our pastor and wife were not but they enjoyed the meals they chose and we hoped it would give them ideas and motivation to eat healthier. The owner came by and told us about Green Fare and answered our questions. She was very informative and kind in her presentation. I would definitely go again but I wish they would come closer to our area with maybe another restaurant. This restaurant caters to vegans. The food was not salted and did not contain any oil, which was a surprise to us revealed only when the food was brought out. At least two items on the children's meal contained hot red pepper flakes, which was very poor judgment for both the chef and us for not asking explicitly. The heat was not indicated or included as an ingredient on the menu. The kids' meals were not edible as a result of the spice. No parent likes to take their kids out to a restaurant that cannot feed them. The ambiance was interesting. The paintings on the wall were of farm animals normally known for their contributions to the American diet. The mountains of books surrounding the tables suggested that the people who eat there were not yet convinced of veganism. For a niche restaurant, I'm sure this is a great spot for anyone who likes paying the 25% markup for the organic label, already is vegan and doesn't like to ingest fat to absorb the many nutrients you're eating (or salt) and whose kids have no problem with spicy food. If you appreciate plant based options, no sugar, no added salt, no oils this is the place to go. Excellent service. Quiet. Large portions. Fresh food tastefully prepared. Totally worth going there. Was looking forward in trying something new but was not impressed with the service. Had to wave to get drinks. Placed an appetizer which took them 10min to realize they were out and took 40mins to receive side salad then main course afterwards. I observed new guest placing their orders and it took less time. Must be 1st time bad luck. Food was too bland and overpriced for what was served. Great healthy food. Friendly staff and helpful with ordering. I will definitely be back. This Cafe is an excellent choice if you are looking for a very healthy meal. The ownership and staff are very committed to serving tasty & healthy food. The staff was very helpful in describing the menu choices and the service was very efficient. We were very impressed with the commitment to offering a healthy choice in a dining out experience. Delicious vegan food. Very healthy, no oils, salt or sugar. Nonetheless very tasty!! Nice restaurant with an unconventional concept. Food is really expensive. They don't serve water, you have to ask for it! Food was very light, non greasy, mild in flavors, in the sense that you could get the real taste of ingredients rather than just the overpowering spices. The quality of the ingredients and the loveliness of the presentations could not be better. The service is outstanding. There is an issue however in that the food is not well-spiced. Although some dishes are excellent, most of the entrees are just plain bland, and adding salt, pepper and hot sauce is insufficient to create good cuisine. I think these guys just need a better chef who knows how to make tasty vegetarian fare.